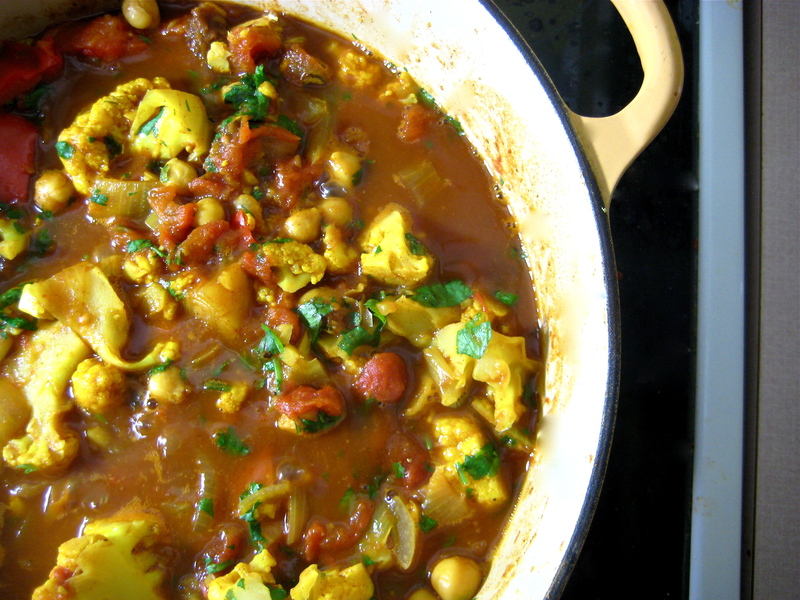 Moroccan inspired flavor comes together in this hearty and healthy winter stew. The addition of dried apricots — which might not be something we add to stew everyday — add a wonderful texture and flavor, so don’t leave them out. It is the perfect balance of sweet and spicy; for more of a kick, add the extra cayenne pepper. Serve alongside fragrant brown basmati rice, about 1/4 cup (60mL) uncooked rice per person. Heat the oil in a large saucepan over medium head. Add the onion and carrot. Cook about 5 minutes, until beginning to soften.Add the ginger and garlic. Cook an additional 1 to 2 minutes more, until fragrant. Stir in the turmeric, coriander, cinnamon, cumin, and a 1/4 teaspoon of the cayenne pepper. Sprinkle with sea salt and flour, and add the chickpeas. 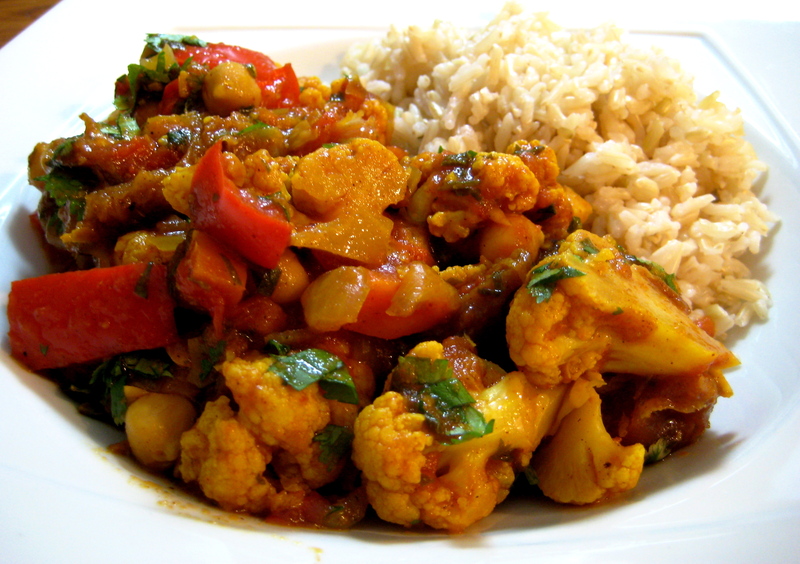 Cook until the vegetables and chickpeas are coated with the spices and the mixture smells spicy, about 30 seconds. Add the diced tomatoes, water, tomato paste, and agave nectar. Mix well. Add the red pepper, cauliflower, and apricots. Bring to a boil, then cover and simmer 15 to 20 minutes, until the cauliflower is tender but still firm. Remove the lid and stir in the zest and cilantro. Cook an additional 5 to 10 minutes, until thickened and cauliflower is cooked all the way through. Let stand 15 minutes before serving. Like most stews, this becomes more flavorful as it stands. I recommend making it in the morning and serving it in the evening. This looks so delicious! Cauliflower can be the hardest thing to find a good home for – I love the looks of this combo – apricots? Awesome. Thanks – just discovered your blog – going to have a look around! Thank you! I am about to explore yours, as well. Hi Laurie, thanks posting that recipe in the Standard. It is sooo good! I laughed when I read your comment, felt a little guilty that I had stolen your recipe but there are some good things that just HAVE to be passed on! You didn’t steal it, and you credited me. Since it is on my website, as well, you can link to my website, which would be lovely. I’m so happy you enjoyed it! It’s long overdue that I post and let you know how much I adore this stew! My insides prefer a low-FODMAP modified version (celery instead of onion, extra ginger instead of garlic, and kale instead of cauliflower) which I’ve nicknamed “happy tummy stew”. The lovely balance of sweet and spice is so satisfying, and the apricots are like a little treat every few bites! Thank you so much for this – my staple for take-to-work lunches on long, hard weeks. Thanks for the note, Emilie! Long since posting that, I do low-FODMAP, too, and I haven’t remade this since. I am glad to hear that those subs make it just as tasty, so I might take this back on. I would love to hear more low-FODMAP snack ideas that you might have!